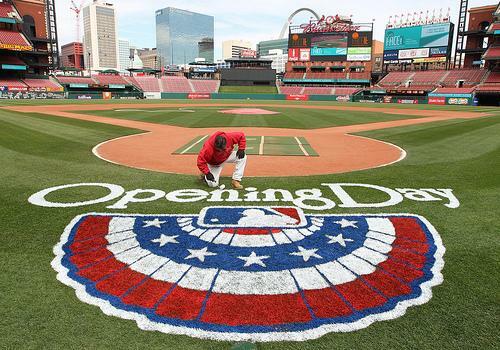 Fans celebrated Opening Day for the St. Louis Cardinals at Busch Stadium in downtown St. Louis. Cardinals ace Chris Carpenter took the mound earlier today against the San Diego Padres for Opening Day of the Cardinals' season. 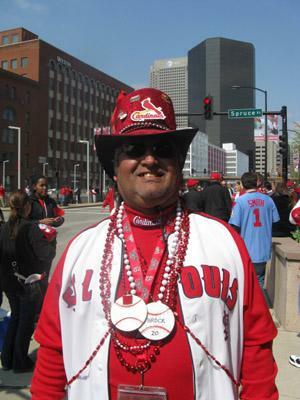 Chris Novak from Maryland Heights is attending his ninth-straight opening day. Like many Redbirds fans, Novak says he's hoping the Cardinals find a way to re-sign their MVP first-baseman Albert Pujols when his contract expires at the end of the season. "I'm a little nervous…you could get some great players with $30 million per year," Novak said. "We've had some great years with Albert, we won a World Series title, but the Cardinals will go on with or without Albert." The Redbirds added several players during the offseason including slugger Lance Berkman and former-Chicago Cub Ryan Theirot. The team is without ace Adam Wainwright this year, as he recovers from elbow surgery. But Joseph Anderson and his friends still like the Redbird's chances in 2011. "This year for some reason makes us feel like its back in '06," Anderson said. "Back in '06 people didn't really give us credit and they didn't think we could really do much and we went on to win the World Series. Yeah, it'd be great to have Wainwright but I think right now we're all feeling pretty positive about this year." The recently-retired former Cardinals center fielder Jim Edmonds threw out the ceremonial first pitch. The city treasurer is a Cardinals fan - and so he's cutting other Cardinals fans a break on Opening Day.